Crush the digestive biscuits or place in a food processor and blend until it resembles a fine crumb. In a mixing bowl add the sugar and crumbs and mix to combine. Drizzle in the melted butter and stir until the crumbs are evenly coated and stick together. Pour the crumbs into a 15-20 cm rimmed baking dish, use the bottom of a glass to press down the crumbs into an even layer making sure to reach all the edges into the corners. Place in the fridge for at least an hour. Sponge gelatine leaves. Heat cream, sugar and cinnamon in a saucepan and stir until sugar is dissolved. Remove from heat and stir in sponged gelatine until dissolved. 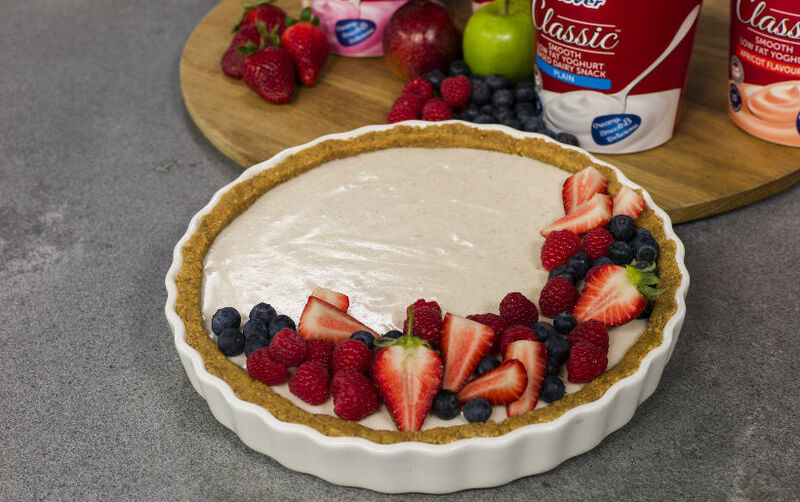 In a mixing bowl mix together the yogurt and cream until smooth and pour into the tart casing. Place in fridge until set.